Exciting news! I was on Nitrateville Radio this week! I had a very enjoyable chat with Mike Gebert of Nitrateville about Pandora’s Box on the excellent Nitrateville Radio podcast. You should all be subscribed to his podcast by now, but if not, here’s a link to the episode I appeared in. And Americans, this is where you can order my BFI Film Classic on Pandora’s Box. While we’re on, I want to say that lots of people have been kind enough to write thoughtful and positive reviews of the book on Amazon UK and on Goodreads so far – thank you to everyone who did that! And if you want to join them, please be my guest. As this book makes very clear, rarely has the blurring of a screen role and real life been so fruitful for a creator and so tantalising for the audience. “Unerring detail”, eh? Don’t let that put you off. Stick out the “unerring detail” and soon enough you’ll get to that “eruption of pleasure”, I promise. Don’t forget! You can see Pandora’s Box, on 35mm, with live music by Stephen Horne, and an introduction by me, at HOME in Manchester on 28 January. Book tickets here. Not much more to say on this, except … except … look out for more from me* on GW Pabst in the new year. Fingers on lips for now. It has been a very special year for this site, and I have been overwhelmed by your support and good cheer in 2017. So, here’s raising a bottle of gin to the festive season, and my very best wishes to you for 2018. Lulu would also like to remind you to vote in the Silent London Poll! And to have a happy Chanukah! Bad news for now – the book isn’t out until 21 November. Good news for now – you can pre-order the book already, on Amazon, on the Palgrave site, or in a selection of other bookshops. This is an extended version of a paper that I gave at the British Silent Film Festival Symposium at King’s College London on 7 April 2017. My book on Pandora’s Box (1929) is forthcoming from BFI Palgrave. There is only one named location in the film, however, and it is in this place that the fictional narrative bumps into historical circumstance – so in this case, geography carries crucial meaning. The final act of Pandora’s Box the film, just like the final act of Wedekind’s play of the same name, takes place in London – in a slum district most likely in the east of the city. Jack the Ripper walks these streets, and our heroine Lulu, reduced to prostitution, encounters him with fatal consequences. This murder is her dramatic destiny, and to understand the film more fully, which was possibly the first cinema adaptation of the plays to feature London and the Ripper, we need to think about the British capital rather than the German one. To explore this topic I am going to examine three disappointing “misadventures” in London: the visits made by Frank Wedekind, Louise Brooks and the film itself. Hello. I have news! And a little request to make. Silent London may be a little neglected over the summer, because I am writing a book. Yay! Just a little one. The site won’t entirely close though: I hope to pop back here occasionally to update you on the progress of the book, and my research, and maybe to find a little company during my summer hibernation. The book will be a BFI Film Classic, on a very special and beautiful movie. I’ll be writing about … Pandora’s Box (1929), GW Pabst’s dazzling take on Wedekind’s Lulu plays, starring the endlessly fascinating Louise Brooks. I know that many of you love this film – and quite right too. So I am very pleased to be spending the summer with Georg and Louise and Frank, sweating happily over a hot keyboard. Film Classics are short and sweet as you may know, but I will still be working full-time so it may take me a little while to get there. And I will probably still be writing elsewhere. As always, the best way to keep up with the other things I write is here on my portfolio site, or by clicking on the “More by me” tab at the top of the site. Obviously, in what feels like the dim, distant future when the book is published, I’d love it if you could buy it, or put it on your Christmas lists, or borrow it from your library, or just tell some interested friends about it. But that’s not the request I want to make today. It’s simply this: don’t be a stranger! Bear with with Silent London while it is on a go-slow – I’ll still post here, and on Facebook and Twitter sometimes. 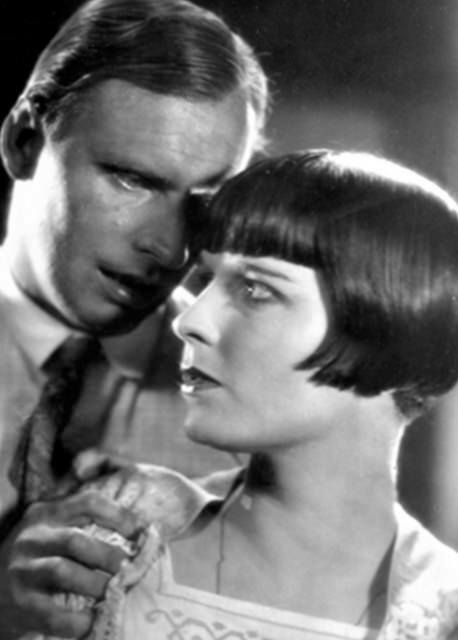 And please be patient if all I seem to talk about is Neue Sachlichkeit and Brooks’s razor-sharp fringe for a while. Time for some exclamation mark abuse, I feel. Louise Brooks! In Pandora’s Box! On the big screen! For free! 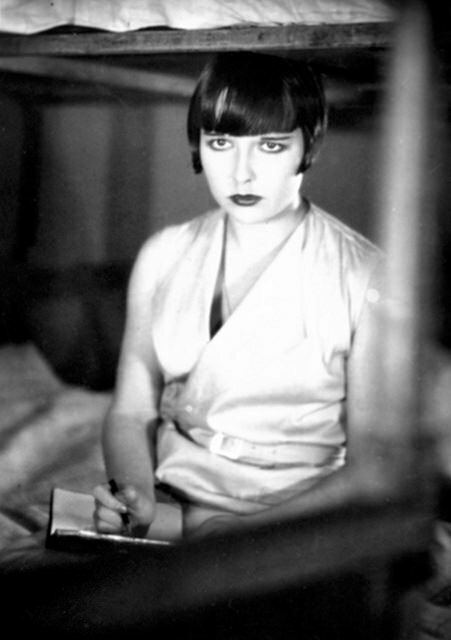 Louise Brooks made one more film with director GW Pabst after Pandora’s Box. What was it called? Know the answer? Then email both your answer and your full name to silentlondontickets@gmail.com by 11 May 2011. When the closing date rolls around I will pick one correct answer at random and the fortunate emailer will receive two free tickets to the Pandora’s Box screening on 26 May. Simple as that. Good luck!